After over 40 years in the floral industry and horticulture, I have collected some web sites of people I have met or studied as I have prepared to teach the subject of floral design. Below, you will find an extensive list. I will also include some other sources that I find very useful, and want to give credit where it is due. I am currently revising and developing a new course at Brigham Young University Idaho called Contemporary Floral Design. I have taught two classes for several years entitled "Interpretive Design" and "Competitive Design." This year I have combined them into one new contemporary design class to focus attention on many of the global floral designers who are pushing the boundaries of design. Estate designing eschews the use of floral foam, preferring a throwback to grid systems of branches and greens, chicken wire, kenzan, or other means of securing flowers in ornate vases. It is a highly impractical style for retail floral delivery, but can easily be adapted to a regular flower shop's repertoire by using floral foam products and decorative wire or branch grids, depending on the container. This influence shook the world of the FTD designer, the triangular and radial patterns of country and American Style flower arranging, and straightened them up into vertical groupings of unified materials. It is a main influence still in contemporary floral design. I first heard of this concept in a presentation Gregor Lersch gave at Snowbird Utah during the Northwest Florist Association Convention about thirty years ago. He demonstrated designs that had form and line in such a distinct way. He was explicit that this was not Ikebana, but, rather a complex presentation of design proportions and ratios, "taller than wide, wider than deep," for example. It was fascinating to watch him put together design after design, including a hand-tied asymmetrical formal linear that he did, as he put it "in my own dirty hands!" This is another topic I first heard about from Gregor Lersch. Whether to stay with a natural use of material, or to alter it with pergaments and spray paints, or decorative wires in bright colours, a designer is influenced to some degree by this argument. I know one florist who refused to use any materials in a design that did not grow together in the same garden or climate. Everything had to match. She is not in business any more. The ability to source materials globally, the introduction of decorative aluminum wires, and other accessories being woven into design materials, or binding them together, and the desire to creatively alter the shape of a flower all lead to a discussion about what is natural versus what is ornamental. This struggle may have been heightened with concerns about environmental impact, manifest through such causes as "the slow flower movement," (ie. Debra Prinzing's "fify mile bouquet"), designers avoiding the use of floral foam by only performing designs that are held in glass or hand-gathered, trying to find locally grown products, or at least not going across the world to buy something that can be found in close proximity. This is such a global industry, yet some push pretty hard to "keep it local" with great passion. Hitomi Gilliam started a trend that lasts still, one of using decorative wire, ribbons, fabrics, foam core, paints, lighting, photography and many other exciting art forms in floral design. One of her early ideas was to create strings of beautiful copper wire from a hardware store, with feathers tied into it, creating a stream of texture that could be used in a sort of superstructure above and around an arrangement. In Gregor's presentation at Snowbird, he actually borrowed one of these feather and wire streamers to demonstrate the term "structuring" as he wove the strand into the surface of the flowers that he had just gathered into a hand-tied bouquet. It was beautiful, and memorable, and often copied thereafter. This also brings to mind the importance of collaboration. 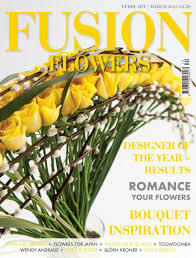 Long ago I could see that the floral design world was changing from a very local to a very global industry. As I travelled to Europe, particularly interested in visiting the Dutch Auction in Aalsmeer, the Netherlands, I observed all through England, France, Belgium, and Holland the practical use of the hand-tied bouquet, interesting flowers I had not seen in the floral markets of the United States, and trendy design techniques that would not show up in North America for a few more years. Learning skills can be a local thing, but learning techniques, being inspired by new things, really requires travel. Yes, today we have the capacity to discover via the internet, but there is still compelling reason to travel: the people. I find it hard to distinguish between a grower or product in North America, Central America, South America, India, Israel, New Zealand, or Holland as better than another. It takes all of them, all of us, to make an industry. Limiting my exposure to other ideas and products just because they are not within a few dozen miles of my location seems so insensitive to offering the best products in the best designs possible. This is one of the highest motivations for me to want to study and practice floral design. Global Floral Production and Marketing. The Netherlands have long provided the best examples of floral production and distribution. A visit to one of the four auction halls in Holland, such as the Flora Holland Aalsmeer facility provides one with a fantastic perspective view on efficient production, and highly practical distribution systems. It is hard to ignore such a grand availability and variety of product when trying to creatively provide new ideas for the industry. If I had to limit my design choices to local product only in Southeast Idaho, I would make snowball bouquets a good portion of the year. As the Victorian Era evolved, the British Arts and Crafts Movement, and the popular influence of Japanism throughout Europe wrestled with the public and eventual professional rendering of designs to make way for the Art Nouveau styles that ushered in the Art Deco period of the 1920's, its revival in the 1960's, and, I dare say, its rebirth today in the 2000's. It appears to run a forty year cycle from popular to professional. Today's abundant communication through social media enhances the growth of popular ideas, whether practical or not. It is for the professional designers to bring order and explanation to the chaos. We spend loads of time helping clients understand that peonies just don't grow in January in North America, yet are so popular in bridal bouquets year-round. This has driven the production end of horticulture to find locations across the globe where such flowers can be produced and shipped, no matter the season. It remains the duty of the designer to inform about the increased costs and effect on prices, at the same time looking for appropriate substitutes. My first exposure to the true hand tied bouquet was watching Els Hazenburg, a Dutch floral designer as she assembled flowers in a display performance at the Ohio Florists Association Short Course back in 1987. I was captured by her technique, practiced and imitated until I could create a perfect spiral of stems that would stand up on the table by itself, without the support of a vase. I observed similar technique with Gregor Lersch at the Northwest Florist Association convention at Snowbird, Utah a couple of years later, and since have seen many other European designers demonstrate their technique. I have wandered through Britain, France, Belgium, the Netherlands, Bulgaria finding related but different variations on the theme of hand-tied bouquets. I watched as Martha Stewart overthrew tradition in the US market by promoting handfulls of flowers for bridal bouquets, imitating the look of the hand-tied bouquet without attention to the detail. The result in America was a dumbing down of design, a popular imitation without proper technique, and I have tried to instruct with precision the proper spiraling, or nesting, or weaving of flowers into true hand-tied bouquets ever since. I find making hand-tied bouquets one of the most satisfying skills I have learned. I taught hundreds of people in Mexico City how to make them once while performing some design seminars. That was a blast. 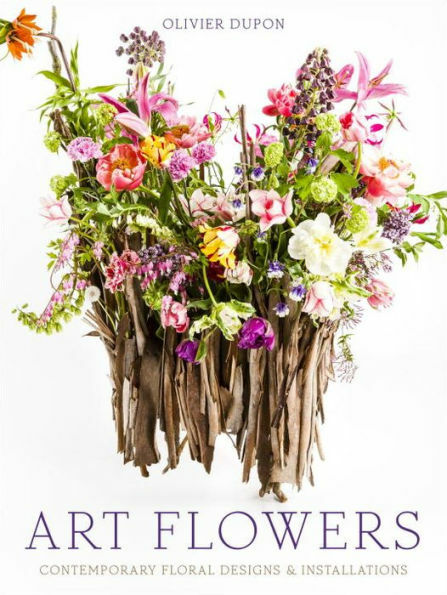 A great source of contemporary floral design ideas is a book by Olivier Dupon, "Art Flowers, Contemporary Floral Designs and Installations"
It is published by Potter Style, a Crown Publishing Company product. This book contains information about dozens of contemporary designers. from Aleksandra Shutz to Tracy Deep, Art Flowers is a feast of design and inspiration. Here is a peek at several great designers.